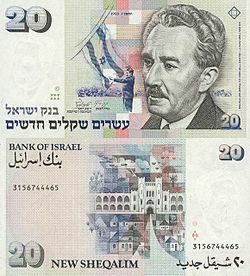 ₪20 Green موشے شاریت Jewish volunteers in دوسری جنگ عظیم; a watchtower, commemorating tower and stockade settlements. 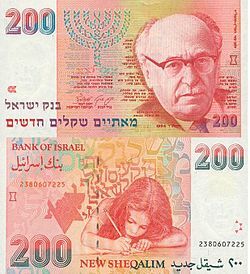 The additional red text on the polypropylene note reads "60 Years of the State of Israel" in Hebrew in red ink. It was only featured in a 1.8 million limited run close to the noted anniversary and is not present on a majority of notes. 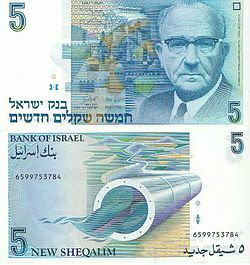 ↑ According to Article 4 of the 1994 Paris Protocol The Protocol allows the Palestinian Authority to adopt additional currencies. 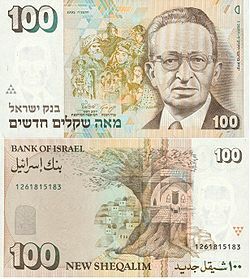 In the مغربی کنارہ the Jordanian dinar is widely accepted and in the غزہ پٹی the Egyptian pound is often used.